This 10" stainless steel piano whip/whisk features a lighter-gauge, stainless steel wire for whipping and aerating delicate sauces and toppings. The abridged stature of this item allows for a more precise whipping of sauces and batter in smaller bowls. This 10" stainless steel piano whisk is very thick and strong. When my handheld power mixer gives out mixing thick doughs I go to my piano whisk. I have to use force to mix the doughs but the wires won't bend. This whisk is built super solid, and is honestly much larger than I was expecting. The handle really fills up your hand, large for many tasks, but if you have a lot to go through great to have on hand. This whisk has been put through the ringer and has held up no problem! High quality, durable, and cleans up easy. Will definitely buy more! I love the whisks that I get from here. This one is the perfect size and it is really nice and sturdy and it works great. Extremely sturdy and well made! Easy to clean and not too big to fit in my drawer. Handy for stirring custards and sauces. Highly recommend! A good standard whisk, I use it for all sorts of applications and the price was great. I have a smaller and a larger one for different sized jobs to complement it. The 10" stainless steel piano whip is excellent. The handle is not too short. It is a great size even when compared to the 12". I like the width of the handle also it is very sturdy. A nice, lightweight whisk that is easy to hold. There is a nice length handle. which allows for easy wrist movement. The handle is also sturdy enough to whisk thicker things. This is a great whisk! It is easy to use for such a great price! I will be ordering more! The whisk is easy to clean and durable! The 10" stainless steel piano whip is a great buy and works well with our baking. An excellent size and perfect for whisking together or dry ingredients for even mixing of ingredients. this 10" stainless steel piano whip/whisk is surprisingly very well made.i plan on buying more sizes in near future.its been performing very well for us. Does an excellent job of whisking eggs. The mixtures turns out consistent in color and texture, leading to uniform eggs. Simple tool, but efficient and good. When I purchased this whisk, I thought I would prefer the 10". However, after using the 12" whisk, I find it much more functional and tend to use it a lot more than the 10". This is why it is only 4 stars instead of 5. The design and craftsmanship of the whisk is great. And for the price, you really cannot beat it. However do yourself a favor and go with the french whisk over the piano wire for general usage. Great piano whisk / whip for a great price! We use this whisk on a daily basis and it stands up to the task. Highly recommended. I need a few more of these! This is a fabulous quality whisk and a great size. I use this at least four times a week. At this price there's no reason not to have a few more so I don't have to use a substitute when this is in the dishwasher. Easy to use and perfect for any job. This stainless steel whip or whisk is perfect for our daily tasks at our restaurant. The handle is nice and sturdy which gives it a great grip. Outstanding product. The 10 inch size works for a wide range of cooking projects and is my personal favorite. Same great quality or the larger/smaller whisks. Thank you! The quality of this whisk is amazing! Perfect for all kinds of cooking! The price is unbeatable. You will not find a good quality whisk like this at your local store!! Good, everyday whisk for baking and cooking. I really like the handle which is easy to grip and is heavy, providing a good feel while using. this has a great feeling in the hand and truly cant be beat for the price. Perfect for when you need something done by hand and don't want to get out the electric equipment. This whisk is a perfect small whisk. it's the right size for small bowls and has enough loops of wire to be efficient and rapid. Love the quality. I have whisks from a home party that were much more expensive and much cheaper quality. Won’t be ordering from their catalog again! This is a great whisk for any small recipe! The entire whisk is made of stainless steel, and it feels very substantial in my hand. The whip is made of thin but heavy duty wires that do a great job of mixing and aerating things, and the handle is perfectly sized for me. This wisk feels sturdy and weighty. The handle is pretty thick for the size of the wisk, it maybe could have been made smaller for lighter applications but is great grip for heavy batters. Heavy duty stainless steel piano whisk! Handle is weighted and feels great in your hand. Wire whisk is flexible and great for whipping sauces, eggs, etc. This is a durable, well designed stainless steel whisk. It is lightweight but has a sturdy feel and comfortable round metal grip. Mixes and aerates evenly. This 10" piano whip/ whisk is strong quality stainless steel material . It's work great for mixing the my funnel cake mix. It's had a good size handle. This is a great whisk! I have several of this style in different sizes. This one is a great for smaller jobs and I'm glad I got it. Amazing product. I love this 10 inch piano whip. It’s dishwasher safe never has rusted on me. And it’s extremely durable. I highly recommend this product. This is a great whisk. Well built and study. It holds up to tougher applications just fine. I highly recommend it for every day commercial use. This is a perfect sized whisk for anyone with smaller hands. All of the great features of the larger sizes but in a more compact and super sturdy 10 inch size! The whisk is not too heavy, but its so strong,works best for me when beating the eggs and helps in mixing my dry ingredients. The stainless steel makes its easy to clean. Very well constructed and a steal for this price! Honestly, it is better built than brand-name whisks I've purchased at big box stores. Flexible yet sturdy. This is a very useful small whisk. it has a good weight to it, I have had far less quality for a higher price. great deal! This whisk has a heavy handle that is helpful for making it work. Ten inches in length, this nice whisk is made of stainless steel. I love the piano whisk. It has a comfortable grip. It is sturdy and durable and works well at beating eggs fast especially great for moms in a rush! Can't complain! Very self explanatory but it does the job. Sturdy build, and will not let you down! It is a kitchen must for any restaurant. The 10" whisk is one of the kitchen tools we use most often. We are always mixing small amounts of sauces and toppings in small mixing bowls and this whisk is perfect for that application. The stainless steel design make this tool very durable and extremely easy to clean. There are many tools needed in a professional kitchen, and those made with stainless steel are generally the best. This ten inch whisk is just the right tool for beating small amounts of eggs. This feels like a good, solid whisk. Only issue is that thicker batters get stuck in the middle, but can easily be fixed by "banging" the whisk on side of bowl. Very good product very strong for the price would recommend this for even the stiffest of batters it has a nice handle that feels good in the hand. These are great! The handles are a little weak, but overall they last quite a while. They are also surprisingly easy to clean. Will continue to order these. Perfect size whisk, comfortable to the hand, to grab and hold. Durable. We use it for batters and sauces. It became an essential part of the kitchen. I was surprised by how well made this whisk is for the price. Perfect for beating eggs, etc. and easy to clean when you're done. This work is perfect for making sauces or dressings it will work very good! You can save money by making things your selfs It will also taste better. These whisks are great! The handle is thick and solid. This feels like a much more expensive whisk. This size is a little smaller than I prefer for most work. I really like the 12" size for what I bake. But any size of this style/brand of whisk is great. This 10" Stainless Steel Piano Whip/Whisk is such a great purchase. I love the fact that it's strong enough to mix thick sauces and even mash potatoes. Great quality and will last for a long time. The 10" Piano Whip is one of the best whips that I have purchased. It works very well for scrambled eggs. The quality definitely exceeded my expectations. I highly recommend this whip. Great value! Really like the 10" piano whip, it is sturdy and works well for home use. Like it for frothing egg whites and blending items together. the compact size of this whisk makes it nice for smaller jobs when you don't necessarily need to whip tons of air into something, like certain batters. the handle is a beast and everything feels super solid. This is a good reliable whip with heavy duty tines. Makes mixing pancakes easy and they come out fluffy. Have replaced my old whip with this one. Great buy and great price. This whisk is great at incorporating air in to ingredients, making it perfect for whisking items like egg whites. The wide handle makes it easy to grip, and it's light enough that it is easy to use for vigorous whisking. This 10 inch piano whip is great for small tasks. It has plenty of wires to whip up thinks quickly. I like that it has an actual handle instead of the wires coming to a point and a ring holding them together. I use this whip so much and it still in great condition. almost looks like I don't use it. I use it with puddings, mousse, whipping egg whites, and even heavy cream for whipped cream and more all with ease. what a great tool to have in my kit. This is a smaller whip for small jobs. I use a 12" version of this most often, however, this one is perfect for eggs on a Sunday morning at home. The quality of these is amazing at this price. I really like this nice piano whip. It works great for any kind of cooking. SIze is just perfect co any small portion cooking! Great price and quality! This is a great whip, very sturdy and at an unbeatable price. I would buy it again. 10" is the right size for any use. Wires are very thick so this is a great whip for thick batters or sauces. The wires are attached to the base in a way that prevents water from collecting and causing rust. Haven't had any complaints about this whip. I was surprised how sturdy this whip was for what I paid. Works perfect for sauces, creams, eggs etc... Doesn't take up much space and gets the job done. Not all whisks are created equally. A simple tool made well can make all the difference. This whisk for sure fits into that category. I had to whip up some whipped cream by hand after a broken mixer. I was whipping like a mad woman with another whisk and our was taking forever. Frustrated i grabbed this one and instantly I could see a difference. That night I whipped alot of cream and with this whisk it was fine. Well constructed. Love this whisk! I was in need of a whisk to fit my smaller pots. This one is the perfect size. Although it is small it is very durable and the handle is solidly built. I can mix sauces and mousses but it also stands up to my thicker batters. These have worked great for whisking eggs while I make quiche. I find them to be very sturdy and easy to clean too. I would recommend. love love this wisk! is super hardy and i like that it has no opening for food piece and stuff to get in it, the price is amazing for the good quality of it! Everyone needs a good piano whip. It is something you can throw in with your utensils and be sure to use it hundreds of times. Good product! Whip has great quality and holds up well after repeated use and abuse. Purchased at a fraction of the cost from our regular supplier. Shipment went out immediately. Thank you! These are the best, most durable whisks you'll find anywhere! I've purchased multiple sets to give as gifts, along with measuring cups & spoons. Such high quality. Average whisk. It does the job that it's designed to do. It also doesn't last very long in a high production kitchen. Spend the extra money and get the Vollrath whisks. This 10" piano whip is a great size and has held up super well in our busy commercial kitchen. The wires stay together but are flexible enough to reach the edges of the pot. Great buy! This is a very nice piano whip. The wires of the head are thick and sturdy but they have just the right amount of give. The handle is made of a thick stainless steel and rolled into a nice width that fits comfortably in your hand and affords plenty of control. This whip is so sturdy. I was very pleased with the overall construction. It is easy to clean as well. Would definitely recommend as a great whip! sturdy and strong. other whips don't compare to this one. Easy clean up and easy on the wrists. love it and should have bought more. Just like the french whip, this one is of the same great quality. The wire connects to the handle very well. It's a quality item. The 10" whip is my go-to whip. The piano style is useful for almost anything and the thick handle makes it very easy to control. The 10" piano whip is awesome, the handle is very sturdy and fits well in my hand, there seems to be some kind of material in the barrel of the handle to aid in momentum. I highly recommend. A nice durable little whisk. I use it the most for mixing up dry ingredients when baking, but it works well with wet ingredients as well. A great tool for making eggs, small portions of solutions, and stores nicely. It fits well in your hand which aides in the tireless nature of whipping. The 10" piano whip is a light-gauge whisk, made of stainless steel wire. It has a comfortable handle and is easily cleaned. 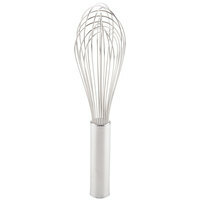 This more delicate whisk is best suited for more delicate whipped toppings, sauces. It is best suited for use in smaller bowls. A must have item in any kitchen. Great product, but not what I was looking for. The wires are very close together and it makes anything but thin liquids hard to mix. For the home chef looking for a basic whisk (as I was), I'd recommend getting a french whip instead. I love this risk for things that are in a smaller ball. It does have a thicker handle so that your hand can go around it but it does work out really well! We purchased these whips for our school culinary arts program. They are just the right size for little hands to manipulate. Most of all they were an amazing value! They arrived well before the promised delivery date. Great whip for making curd, whipping cream and any recipe that requires the perfect whisk. We use this one every day in the kitchen. (we should of bough more than one). lol! This whisk is great! You can not beat the price! Whether you are using it for home cooking or commercial, it does the job great! Will order again! This whip is kind of plain looking, but it works very well! I've used mine mostly for mixing bread or cookie dough, and it does it with no problems. It's also really easy to clean. I love this style of whisk and it was the perfect size for normal every day baking and whipping. It is a little more stiff or heavy then I expected but still a good product. Outstanding tool for the kitchen. The quality is exceptional and when you factor in the price it really is an inconceivably good deal for this. It works great and appears that it will last a very, very long time. This is a very good whip. The tines are very sturdy and the handle is nice and heavy. Very pleased and will add it to my rebuy list! This 10” whisk is good for whisking butter into sauces. Due to it’s size, it is less likely to splash liquid all over the place. Awesome little whisk! I done think the 10" Whisk is actually big enough to do anything serious, but when I make myself personal mousse or a quick omelette I find myself reaching for the little 10" whisk due to its convince. I was originally going to buy some elsewhere. But why should i pay more for a product that is virtually the same. Then i found this on your website. Ive know about this site for maybe 5 years but never really bought anything until recently. I love how the items are exceptional quality and the price is outstanding. I will never hesitate to purchase more. And as alway i will definitely recommend. This is a fantastic wisk. The tines are very sturdy and the handle is nice and heavy. I keep several in the home kitchen because I use them for almost every meal. Very pleased. Short-handled and surprisingly weighty - it does give your wrist a workout - this is an excellent quality whip for the price. One of many superb inexpensive stainless steel products here. I really love this Piano Whip. It breaks up clumps with great ease. I don't think I would like another whip any better, and it is a great price. Wonderfully large size helps in gripping it while mixing thick batters. This whisk seems to be the all around best size for general mixing. Wish I would have bought more for this price. I absolutely LOVE these! There is no better wish out there! They have very thick wires and a thick comfortable handle. I doubt if I'd ever want another brand in my kitchen! I love this whisk!!! I only wish I would have ordered one with a little longer handle, but it is so sturdy. Will definitely be buying more of these. I love using this whip for quick jobs that don't require a hand or stand mixer. The wires are thicker than you would see on retail whips and don't bent easily when you hit the bowl while whipping. The build is solid, all stainless steel. For the price it's a fantastic value. Good whip. The handle is not 100% solid, it feels like it is filled with sand or something. Also, the end cap does not perfectly align, but for the money, it's a great whip. Good size for most kitchen tasks. These whips are super sturdy. I think you could use the handles to drive nails and then switch to whipping up something in the kitchen without ever batting an eye. I couldn't believe how heavy duty these were when I ordered them. I think my grandkids will still be using them. Great little whip for the price. Pretty tough, although I have had to break off the outside loop on all of them at least once. Sturdy, great feel, can't go wrong for the price. This 10 inch piano whip is wonderful. I love the size and the way the whip is flexible, so that it whisks fast and effectively. The stainless steel construction is very sleek and is also great in terms of washing and keeping clean. It is a great quality product for a very low price. Great buy on piano whip. Great for mixing. Good quality. Very pleased with item and shipping was super fast. Highly recommend this product and all from this company. Forget OXO and get this - just like their french whisks, this is a beautiful piece. The small size is perfect for mixing sauces, mayo blends, pancake batters, etc. Don't forget to pick up the 12". I use it mainly to beat eggs and make dressings. It is very sturdy and is made well. One of the cons of this product is the handle does seem bulker compared to the wires of the whip. However, this is a minor con and this product does what it’s supposed to do for a good price. The quality and price point of this product is excellent. We aren't able to find this at our local restaurant supplier. The utility is as expected. What a great buy! I love this whisk it makes mixing so easy. Its the perfect size too. In the kitchen for me this is a must have! Nicely weighted whip for delicate mixes and more solid liquids. If that makes sense. I like the finer whip for eggs and the like that tend to stick to themselves rather than the tangs of the whip. This 10" Piano Whip is easy to use and for whipping homemade salad dressing and mayo. It is sturdy and you don't have to worry about bending. Great product. This 10" piano whip is great, my previous ones would just brake immediately or the wires would loosen up really fast but this one has been quite durable and of great quality. I love whipping up my western omelets with this 10' whip. It is also the perfect size for whipping up creams, for our special sauce. It is made great quality, well worth the price. The 10" piano whip is a great item to have in any kitchen. We have used this device multiple times, good quality and durable. Cleans wells. I use these in cooking classes for my students. They are constructed solid and durable, so they will not need replacing. Easy to clean. The best part is the size. Excellent individual size when you have students that need space for tools. This little whip comes in so handy for so many tasks. It blends gravies in the sauce pot, it whips up egg whites beautifully, and mixes up a small batch of waffle batter like a breeze. I would not be without one in my kitchen. Great whip, perfect to make french toast mix or something not real big. I order 3 different size, all of them are very strong. Love them all! Can't wait to get it I'm ordering because someone in school swiped mine I looked everywhere for a replacement and found your site after over two weeks of looking by far the best price & high end quality my item was technically brand new a hand full of uses but this one I'm marking and no one can take it! Oh how I've missed my whisk! Nice 10" Piano whip. I like the length & the handle size. I can use it a long time whipping cream without getting tired easily. I love this whip because it's smaller so that I can really fluff up my meringues and whipped creams. The thicker whips make it harder. This whip is great for stirring sauces in a sauce pan. It is much better than using a full size whip. The feel is very comfortable and they hold up well. This is a great whisk to make sauces with. It can very easily whip up cream and egg whites. Excellent for making meringues and hollandaises. The piano whisk has flexible tines, making it easier to mix food in a casserole dish with a flat bottom. It also incorporates food better so you're done quicker! I use my piano whip to make my mother's easy One-Cup cobbler. 1 C self rising flour 1 C granulated sugar 1 C milk Whip together in a casserole dish. Melt 1 stick of margarine in a saucepan. Add 1 - 2 cups fresh or frozen fruit, or a can of fruit pie filling. Pour this mixture into the flour/sugar/milk mixture.Do not stir! Bake in a preheated oven on 400 degrees for about 30 to 35 minutes until golden brown on top. Top with ice cream. YUMMY!!! This whip / whisk should be standard issue in any kitchen. It is perfect for mixing eggs and making smaller batches. I would also recommend getting one of the larger whips as well. This whip is sturdy, but I just wish that the handle wasn't as thick. The handle is just a bit overwhelming compared to the wires. Excellent 10 inch piano whip! Well built and very easy to clean! Good for making whipped cream from scratch or to whip up your favorite cake batter in no time!!!! i love this whip. much more durable than anything you could buy in a local store. mixes great, and it is dishwasher safe. Great for the price!